I am basically obsessed with packing as much Comprehensible Input into my little darlings’ brains as I can muster during a 95 minute class. There’s a back story. There’s always a back story. So armed with these two focusing goals, I initiated an obsessive witch-hunt searching for anything and everything not Comprehensible Input. I really honestly looked at all my activities/projects/ games/ practices/policies/procedures for the entire year and cut out or modified everything didn’t give me the Input Impact I was after…there just wasn’t time in my new schedule. One of those things that didn’t meet my goal was vocabulary quizzes…Yeah, I think they’re important so I can give my little darlings a grade (actually, I wish I didn’t have to give them grades, but that’s another post for a different day) but in my eyes, the minutes that they were defining vocabulary words could be better spent on input. How could I give them input at the same time AND assess their vocabulary acquisition?! Here’s what’s been working for us: I write little stories, with specific words underlined. They still translate specific words/ phrases but now they’re reading also. And they’re looking at context! And I think there’s more “real world” application here… I mean, in real life, how often do we have to define a random, contextualized word? Rarely? Never? Bueller? Bueller? Here’s the vocab quiz my Spanish 2s took last Friday. I kind of love it…It’s not earth shattering and I’m sure I’m not the first one to write story vocabulary quizzes! I just think it was the process that makes it really meaningful to me: taking a situation that I thought was going to be devastating and figuring out how to make it work for me and my little darlings. Actually, now that I’m two years on the other side of the new schedule, the process of reflecting on every minute I have with my classes has really helped to sharpen my skills and become acutely aware of how I spend those precious minutes. Do you have a list of your questions of the day that you would be willing to share? What a great idea! 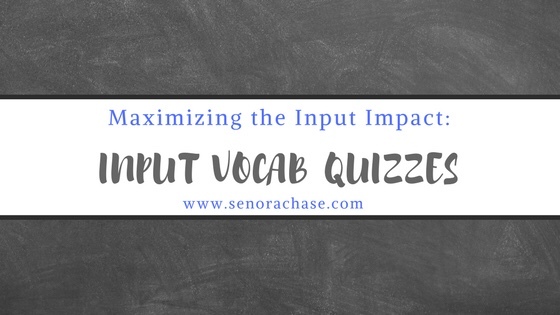 I do “check-ins” on quizzes but I love this idea to get them to open up a little more!